Your food shouldn’t be the only hot item on your table. Patterned dinnerware is in this season. Companies are offering patterned sets and pieces with unique shapes to accommodate specific entertaining needs and suit a variety of personal tastes. These sets are designed to add color and creativity to your kitchen table. Replace your mismatched and plain dinnerware with bold hues and striking patterns. With several color schemes, modern designs and unique shapes to choose from, updating your kitchen is as easy as setting the table. To stay current with consumer trends, we've added an assortment of patterned sets to our award collection. The Nouveau set from Corelle® has classic paisley printing in contemporary black, gray and white. This ultra chic pattern is on trend with modern motifs in neutral color combinations. The Flo set from Corelle® features a versatile, contemporary, geometric design with broad appeal. 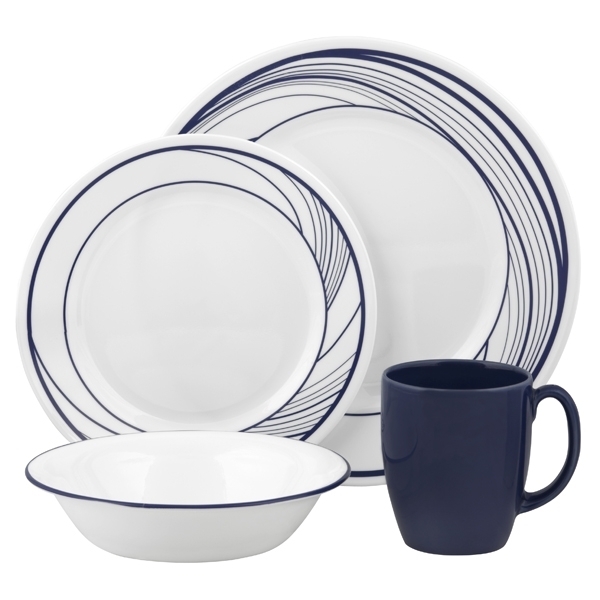 The blue graphics cascade wonderfully across the wide-rim plate, giving it movement and style.